You maybe asking yourself why would you want to have your own custom made subliminal cd recording. There are various important reasons why. Here are just a few…. 1. Get a customized, state of the art professionally recorded mp3 to assist you with personal change and empowerment. Your name will be recorded throughout your custom made subliminal messages cd recording as well as your specific needs, wants, desires, and end results. This creates a very powerful effect! 2. You identify better when your name is repeated throughout your custom made subliminal cd recording compared to a generic subliminal mp3 on one specific topic. 3. Your custom made subliminal cd recording is tailored to your behavior patterns and current situation. You can pick up to THREE different areas to work on within your custom subliminal mp3. You are not limited to just one subject. 4. Everyone is uniquely different and respond better to certain suggestions. Some people like to add specific suggestions or ideas to their custom made subliminal cd recording. 5. Your can request a long custom made subliminal cd or a shorter recording. Your custom made subliminal cd can range in time from 40, 35, 30 or 20 minutes. The time does depend on how much you want to work on and if you have various topics. 6. You can request a custom made subliminal cd with some motivation information, which you can listen to while you are driving before you begin the relaxation process at NO EXTRA CHARGE. 7. You may have something you want to work on that is not listed on this web site. You can always ask and we will respond. 10. When you have a custom made subliminal cd, we do like to track your progress and success. It is like having your own support system. 11. I believe your personal changes should not cost you hundreds or thousands of dollars. Many popular website’s will charge you $300 to $2,000 for one custom made subliminal cd. What makes Kerie Logan’s Custom Made Subliminal CD Recording Different? 1. Most hypnotherapist “think” they know exactly what you need and can refuse to work with you when it comes to using your own words, script, affirmations, technique, etc. I tend to disagree. Your words are very powerful because they have emotions behind them to support you in making a positive change. So if you have a script, affirmations or a specific method you prefer, just tell me. If I feel its in your highest and best to change some wording or language, I will tell you “WHY” before I do it. After all, the custom made subliminal cd recording should be what your expect. 3. I allow you to preview your custom made subliminal cd recording before finalizing it. Most Hypnotherapists will not allow you to make any changes or suggestions to your custom made subliminal cd recording. Once its recorded, its done. With me, you get a one time chance to add, delete or change anything. You want the music lower, fine. You want no music, fine. You want binaural beats, fine. You want frequency tones, fine. You can even have a double voice process added for FREE. Just ask me. I am here to be of service. If you like, after you have processed your order, you can contact me via email at empoweredwithin@yahoo.com. Once you get your custom recording via email, you will have 5-days to notify us via phone or email your request for any recommended changes to your custom recording. If you wait past the 5-days, we “may” grant another 5-days grace period to make minor changes. After the 10-days, all custom sales and changes are final. We do not make adjustments or changes to custom audio recordings after 10-days. Refunds will not be issued. Empowered Within handcrafts each of our subliminal audio suggestion-messages, using a licensed Subliminal Recording Software. We have combined the most effective direct subliminal suggestions and subliminal messages to deliver you the results you seek. All our custom made subliminal cd are professional, honest and effective in sending positive affirmations directly to the subconscious mind, bypassing the more critical conscious mind. There are many different ways in creating a custom made subliminal cd. Most subliminal cd manufacturers choose one method, such as a “background whisper”. We combine the five subliminal mechanisms to assure results! 5. 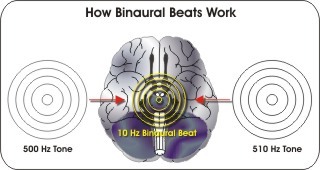 Binaural Beats: Binaural beat recordings work by sending certain slightly different tones to the left and right ears. This creates a third “binaural beat” inside the mind at a specific frequency. This frequency is specifically chosen to generate a certain mood, such as relaxation or creativity. The binaural beat frequency may change multiple times during a session to give you the best experience possible. Binaural beats are specially generated sound frequencies that can be used to alter your brainwaves and influence your moods. You can use binaural beat recordings to bring about specific states of consciousness, such as relaxation, creativity, or being “in the zone”. What are Subliminal Audio Suggestions and How Does it Work? Subliminal Suggestion are messages designed to pass below the normal limits of perception, so you are less likely to reject them consciously. Subliminal suggestions are perfect for those strong willed people, who don’t like being told what to do and keep sabotaging themself. That’s why the subliminal suggestion are inaudible to the conscious mind, yet audible to the unconscious or super conscious mind. So the subliminal suggestion is transmitted briefly, unperceived consciously and therefore perceived unconsciously. How Powerful are Subliminal Audio Suggestions? Subliminal suggestions/messages gain potential influence over your subconscious mind. It is so powerful that they may be able to circumvent the critical functions of the conscious mind, and it has often been argued that subliminal suggestions/messages are therefore potentially more powerful than ordinary suggestions. Here’s an example: Let’s say someone tells you, “You look really pretty in that dress.” If you’re not use to compliments, you will immediately reject it. Now if you’re listening to a subliminal suggestion audio recording for self confidence, you will NOT consciously reject the suggestions. Therefore, it is suggested that you listen to subliminal suggestion for at least 28-days to get the best results. The first documented and tested Subliminal Advertising was in 1957, in Fort Lee, New Jersey at a local drive-in theater. At this drive-in theater, they quickly flashed the words “DRINK COLA COLA and EAT POPCORN” for 1/3000th of a second every 5 seconds over Kim Novak’s face and throughout the movie during a 6-week run of the film Picnic. The subliminal message was the brainchild of NY market researcher, James Vicary. Mr. Vicary boasted that Coke sales in the lobby increased a whopping 58% and that popcorn sales rose 18%. Outraged citizens and congressmen produced more research on the subject and conflicting results have been bandied ever since. Yet these tricks and secrets are still active today. Here’s an example: I have a friend, who works in Real Estate. He told me that when he shows a house, he will have a jar of chocolate chip cookies in the kitchen. Before the potential buy comes to view the house, he sprays the room with scent of freshly baked chocolate chip cookies. Why? It gives the potential buyer the “feeling of home”. Supermarkets use this same trick as well as TV commercials. If it warms your heart, if that melody keeps playing in your mind, or if the smell of fresh baking bread makes you want to buy, you will most likely buy it. Just walk into Costco and you will see all the food vendors. If you sample it, you will most likely buy it…even if it was not on your shopping list. How to get the BEST results using Subliminal Audio Suggestions-Messages? There are two great secrets about Subliminal Suggestions-Messages. First, you don’t have to be lying down or relaxing to have them be effective like your typical hypnosis or meditation audio recording. You can be cooking, working, cleaning, exercising, sleeping, etc. Second, you MUST listen to the subliminal suggestions-messages with ear plugs or headphones. Why? Well the suggestions are so faint that only the inner ear can hear them. If you’re playing it out loud, you will not hear or benefit from the suggestions-messages. This is KEY!!! !